Our holiday home is situated in the mountain village and ski centre Hohentauern (1270 m). You’ll love it at our place, the old building – dating back to the 15th century – has a fantastic atmosphere, but you still have all the modern comforts to enjoy. The pistes and cross country ski trails are just a few steps away, while in summer marked footpaths pass by right beside the cottage. From your bedroom window you can enjoy a breath-taking view of the highest peaks of the Rottenmanner Tauern. Our accommodation is fantastic for families with children or groups of friends. Our cottage was originally a mill, built in the 15th century. In fact, you can still see the preserved waterwheel. Now, it has been completely renovated and offers comfort, central heating and an uninterrupted supply of hot water (from the village boiler). The cottage has three bedrooms, a sitting room and kitchen, a magnificent dining table and seating around the fireplace, bathroom with a shower unit and toilet, as well as a separate toilet in the basement. The house can put up two families in comfort for a week’s stay, and with maximum use of beds and a little tolerance, it can provide accommodation for 12 people. In addition, there is another bed which can be used in the attic in the little hallway between the two bedrooms and there’s a children’s cot that can be put up in either of the two attic rooms. Kitchen appliances: 2 induction hobs, large electric oven, kettle, fridge, pantry, high chair and all the pots, pans, utensils and tableware you’ll need. Upon your arrival we’ll welcome you with a little slivovitz and show you all the cottage’s equipment that you might want to use. We can also advise you in greater detail about all the tours, trips and various activities hereabouts, and we’ll lend you a detailed map of the entire local area for the duration of your stay. If you have any particular wishes or queries, I’m always willing to help (use the contact details provided), both before you come and at any time during your visit. In the next door building you’ll find a little shop with general food items, so you can pop round every morning in your slippers to stock up on fresh rolls. 50 metres from the cottage is a large general-purpose car park, where guests will have no problem parking several cars. The village itself has its own small ski resort with 8 different pistes. The nearest ski-lift is 200 m from the cottage, so it’s no problem walking to the slope even with kids, or returning to the cottage at noon for a hot lunch. The Hotel Moscher has a slow children’s J lift on a slope that is ideal for teaching kids to ski. It also has a short magic carpet for the little children. Often, we are the only ones skiing here – queues are few and far between. If you want to ski down some longer slopes, it’s worth heading over to the nearby Lachtal ski centre (38 km / 40 min. by car). In Lachtal you can find 25 km of pistes at an altitude of 1600 – 2200 m, 2 fast 6-seater lifts and 8 T-bars. Check out their website for more information: If you are staying for a week, another interesting possibility is to take at least one trip over to the giant Ski Amadé resort at Schladming. It takes about an hour in the car to reach the huge car park at Hauser Kaibling for the cable car. Besides downhill skiing, Hohentauern offers several sports circuits for devotees of cross-country skiing. Right here you will find a total of 13 km of groomed trails, starting about 300 m from the house. At the start of the cross-country circuit you’ll find a ski-hire place, where you can get completely kitted out with Fischer gear - either for classic or skate-style skiing. They’ve got everything for small children too. A sports cross-country circuit is the perfect way for mums and dads to let off steam in the early evening after a day on the slopes with the children. And when the sun is out, cross country skiing with a view of the mountain panorama all around is an experience to be treasured! Other super winter attractions include the 5 kilometre sledge run from the Edelrautehütte. Here you can hire sledges and organize races for kids and adults. Sledges are then propped up against the barrier at the end of the run and at the hut owners come down and pick them up later. We have one sledge available for use at our cottage. There are countless opportunities for hiking the passes and climbing the mountains around Hohentauern in the summer. Several marked trails start just a couple of metres from the house, others also start nearby. Besides the tougher stuff, there are also myriad attractive walks and trips to take with the smaller children, exploring the local streams and valleys, visiting the trout farm at Pfahlbaudorf or exploring Lake Scheibelsee. In Hintertriebental you can see huge hairy mountain cattle, or you can take the children to Keltenberg for a 70 metre long slide down the slope (about 2 km from the cottage). One of our favourite summer pleasures is picking bilberries, which grow in great abundance on the surrounding slopes. Another is mushrooming, which is doubly enjoyable here because the locals don’t seem to collect them. It’s not unusual to find ceps weighing over half a kilogram. Cyclists are offered several very nice bike trails in the area. We particularly recommend the cycle trails along the banks of the Mur or the Enns, which are more or less flat and can be enjoyed in comfort with children. In addition, the River Mur is followed along its course by a narrow-gauge railway, which returns you back to your car. Both cycle trails can be extended to create multi-day trips. Another possibility in the spring and summer is to take to the water – rivers close enough include the Steyer, Teichl, Enns, Salza, Mur and Polsbach. I´m Czech living in Prague with my family and the house in Hohentauern is our holiday house where we go anytime we have few days off. I like travelling and all outdoor sports in the mountains. My favorits are trekking, ski touring, climbing and seakayaking. 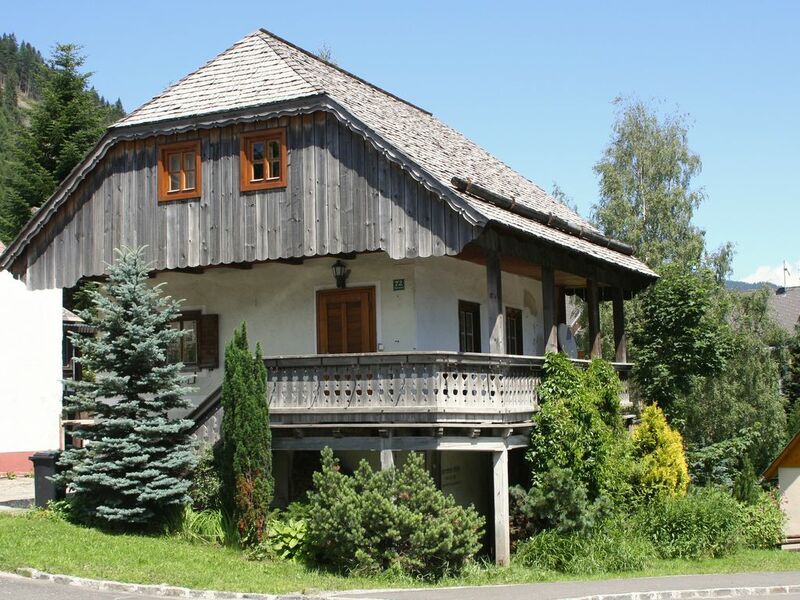 The house in Hohenteuern is a perfect base in the middle of the mountains for any outdoor activity. The best conditions for hiking, trekking, mountain biking, downhill skiing, backcountry skiing and ski touring. Due the distance of easy signed hiking trails in summer and ski lifts in winter very suitable also for families with childern. The "emergency" toilet in the cellar. Bed linen and towel cost 8 EUR per person extra (optional). There is a large public parking place about 50 metres from the house where you can park more cars. You can stop directly in front of the house to drop off your bags of course. Inductive hob with 2 hotplates. Fully-equipped kitchen with the dinning area with a large table, 8 chairs, child´s highchair, sofa and fire place. Playing cards, cubes and big choice of desk games are available just next to the fire place. There is a small private grassy area behind the house. We place a hammock here in the summer season. It is a fun for childern and a nice relax for adults. In the next door building you’ll find a little shop with general food items, so you can pop round every morning in your slippers to stock up on fresh bread. War alles super! Für Hunde nicht gerade ideal,weil neben der Hauptstrasse! Haus ist gut ausgestattet und sehr zentral! Geschäft gleich um die Ecke! Danke für Ihr Besuch Herr Pernegger, ich hoffe dass Sie Ihr Wochende in Bergen genossen haben. Danke auch, dass Sie das Haus im sehr guten Zustand und sehr sauber belassen haben. Meine Tür sind für Sie immer geöffnet und Sie können zum nächstenmal billiger direkt auf meiner Seite lachtal.eu buchen. Unser aufenthalt in der alten Mühle mit zwei Familien war sehr angenehm. Das Häuschen ist wirklich nett und gemütlich eingerichtet mit allem was man so braucht. Auch mit unseren kleinen Kindern war es sehr angenehm. Der Vermieter war bei unserer Ankunft vor Ort und hat uns sehr freundlich begrüßt und uns alles gezeigt. Hohentauern is the highest village in Styria (1270 m), 10 km from the town of Trieben (A9 motorway). Hohentauern lies in a mountain pass in the Niedere Tauern and the surrounding mountains are over 2000 m high. Hohentauern rewards its visitors with many things to do – both in winter and summer. It is the perfect place not only for a week’s family holiday, but also for an extended spring or autumnal weekend with friends in the Alps. From the A9 motorway take the turn-off for Trieben. Drive through the town of Trieben, following the signs for Hohentauern. Keep climbing for about 10 km along road no. 114. As you come into Hohentauern, our cottage is the 4th house on the right. In winter, make sure your car is fitted with snow chains – they’re rather useful in fresh snow. If you’re staying with small children, I’d certainly recommend a walk around the fishponds at Pfahlbaudorf, the 70 m long slide at Felsenwelt and a trip to see the hairy mountain cattle in Hintertriebental. In winter, don’t forget to experience the 5 km long sledge run from the Edelrautehütte. A picturesque valley leading up from which are numerous beautiful, marked hiking trails, and which in wintertime is the starting point of many alpine ski-tours. We recommend heading towards the top of Moarlm and further on up to Triebenfeldkogel, which is an easily accessible summit with 360 degree views; or make the ascent up to Gamskogel – a hard rocky peak and dominant feature of the surrounding region. A beautiful summit with superb views which isn’t climbed by hikers as often as it should be. Drive as far as the car park at the head of the valley Bärntal and then climb up through the valley of Frattental until you reach the pass Triebener Törl. From here you follow the ridge with its panoramic views up to the summit.